I never do valentines. I don't mind handing them out, last year I bought CareBear valentines to give. Although I paint cute lovable things all the time, to focus on Valentine's Day always comes to me in many frustrating ways. I guess it's because there's such a cliché attached to it. Or maybe because the day was created for only money making purposes. I dunno. But this year I really wanted to create something. I was going to make cards to sell on Etsy or on my site, yet instead the cards evolved to this one 5x7 painting. Love is an action, not just a word, and not just a feeling. 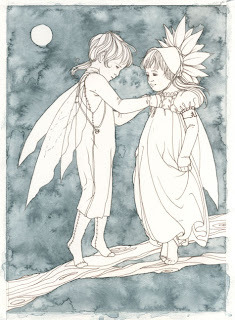 Here the fairy lad is expressing his love for the fairy maiden by tying her flower bonnet. Brian always does little things like this for me, and I always feel so loved by him and know that it is a true expression of his care for me. Thank you Sara Butcher,its very true indeed.Well any gift made by self would really express the inner love.Anyhow Have a Great Joyful Valentine ahead.